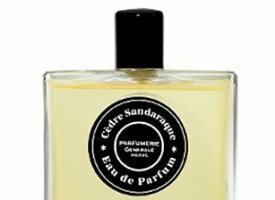 Cèdre Sandaraque is among the latest crop of releases from Parfumerie Generale, and is described as a gourmand with "gilded cereals and amber praline". The fragrance notes include vetiver, African cedar, sandarac resin, cereals and pralined amber. Cèdre Sandaraque announces its gourmand intentions right from the start: the opening is strong and sweet and vaguely edible, although it doesn't recall any particular food that I can think of. The cereal grains are pronounced, and there are hints of citrus, nuts and dried fruits. The sweetness calms as it dries down on skin, leaving a pale, woody amber base with resinous undertones that continue to intensify over the next few hours. Sandarac resin, which I've never smelled on its own, is said to be similar to frankincense but with a lighter, fruitier aroma, and that would seem to be accurate here. As Ina has already pointed out on Aromascope, Cèdre Sandaraque has some similarities with Parfumerie Generale's Aomassaï; both fragrances follow the same path from a candied top note to a drier, woodier base, but they are not smell-alikes by any means. Aomassaï is richer and darker, and to my nose, maintains its gourmand character longer into the dry down. Cèdre Sandaraque also strikes me as a distant cousin to Hermès Vetiver Tonka, with an emphasis on the "distant" — it isn't nearly as earthy, and hey, nothing can top Vetiver Tonka. Still, Cèdre Sandaraque is very nicely done. After two hours on skin, I adore it, but I haven't decided if I like the first hour enough to buy a full bottle. And I'm still puzzling over Querelle, another fragrance from the new Parfumerie Generale Private Collection. In some ways, it strikes me as the most interesting of the set, but for all that, I can't decide if I love it or hate it. Do comment if you've tried it. Cèdre Sandaraque is an Eau de Parfum, and the lasting power is very good but not quite fabulous. For purchasing information, see the listing for Parfumerie Generale under Perfume Houses. I sort of see what you mean by distantly reminiscent of Vetiver Tonka. It's like a sweeter, more gourmand Vetiver Tonka. It is nicely done. Goodness, I adore both Aomassai (one of the highlights of the year for me) and Vetiver Tonka (trudged across London on Jan 1st to acquire it)…so this sounds utterly unmissable. I'm dying to hear about the Querelle. Thanks, R! I am not sure exactly why it calls up VT for me, but the first time I sprayed it on, VT is what I thought of. Wore them together, and in fact they don't smell much alike — just a similar feeling. Does not Vetiver Tonka have cereal grains? Could that be the connection? PS Naz at The Perfume Shoppe does have the Private Collection at comparatively good prices. I thought that might be it too, but really I can't smell the cereal grains in VT.
And I will have to try the Querelle again. I do think it might be the most interesting of the bunch.